To confront climate change, we need to make the most of the buildings we already have. By all appearances, American cities are becoming greener than ever before. Sustainable design has gone mainstream, LEED-certified buildings are commonplace, and redeveloped downtown districts — complete with new bike lanes, buses, and light rail — make a low-carbon lifestyle ever-more attractive. But is all of this really enough to fight climate change? In the architecture industry and in the media, most of the attention goes to new buildings, often designed to meet high environmental performance standards. At the same time, some of our greenest buildings may be hidden in plain sight: they’re the ones we already have. A building can only be considered truly sustainable if it remains in use for long enough to justify the resources invested in its creation. Adaptive reuse — the practice of renovating and adapting existing buildings to serve new and future needs — must become an essential part of any city’s strategy for sustainable urban development. As an alternative to new construction, adaptive reuse has less environmental impact at nearly every level. It bypasses the cost of demolition and construction, all while extending the lifespan of our existing resources. In many cases, reusing a building is not only the most sustainable development solution, but also the most cost-effective. And with a sensitive design approach, we can renew historic resources to create lasting civic and cultural value. The crisis of climate change makes it imperative to consider the environmental consequences of demolition. A vast amount of energy goes into a building’s creation, from extracting and processing raw materials required for construction, to hauling and disposing waste from the job site. This is known as the building’s “embodied energy.” Demolishing a building wastes this initial investment. On top of this, add the physical waste of demolition: When a typical 50,000-square-foot commercial building is torn down, about 4,000 tons of material are destined for disposal. A building can only be considered truly sustainable if it remains in use for long enough to justify the resources invested in its creation. Given the overwhelmingly vast building stock that already exists, simply encouraging the construction of new, energy-efficient buildings falls short of a holistic, sustainable approach to development. Adaptive reuse is an essential ingredient. Climate change has made adaptive reuse more relevant than ever before. But it’s also a compelling business proposition. The federal government has incentivized strategies to create sustainable and economically valuable alternatives to new construction. In 1976, amid the unrelenting demolition of historic buildings in city centers, the Tax Reform Act established substantial federal tax incentives for preservation and reuse. It reversed the former tax bias in favor of demolition and building anew — making the sustainable option significantly more financially attractive. In the years since, adaptive reuse and real estate development have become practically inseparable. Building reuse allows for the development of higher density urban areas, while preserving historic resources that can boost tourism, business development, and property values. Few other development strategies produce as much economic activity over a longer period, and in a wider range of the economy, for so little initial investment. 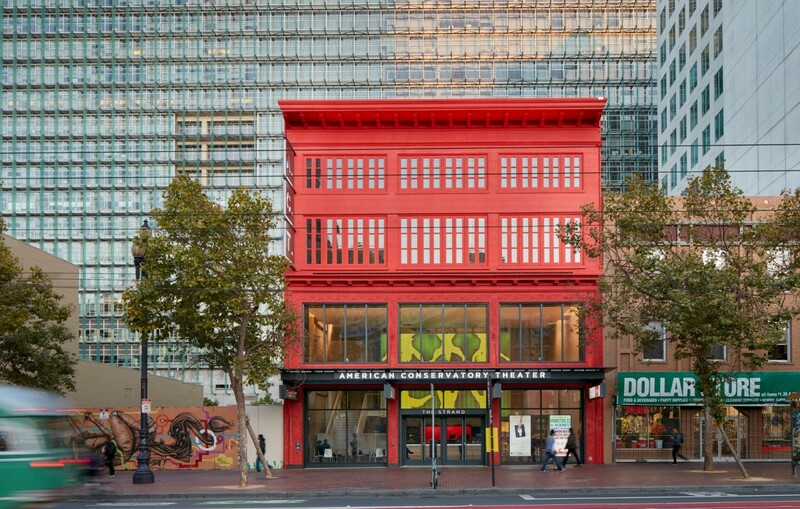 On San Francisco’s Market Street, a century-old theater offers a powerful example of these principles in action. Built in 1917, the Strand began as a silent movie house and operated as a commercial cinema through the mid-20th century. However, it began a steady decline that paralleled the deterioration of the surrounding neighborhood. The building was abandoned in 2003, reduced to the type of “urban blight” that so often is a prelude to demolition. 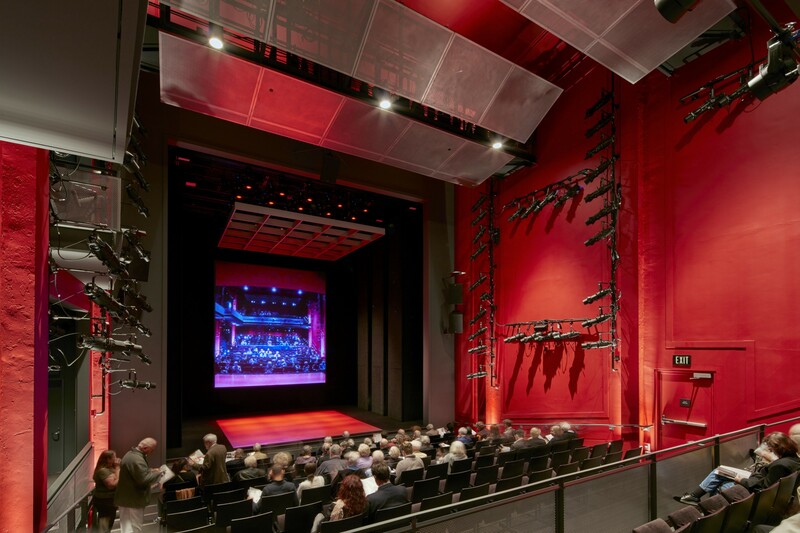 Instead, SOM worked in partnership with the city’s preeminent theater company, American Conservatory Theater (A.C.T. ), to renovate and adapt the building. The project sought to transform the structure to serve as a contemporary live performance venue, while revitalizing this significant but neglected urban landmark. A.C.T. 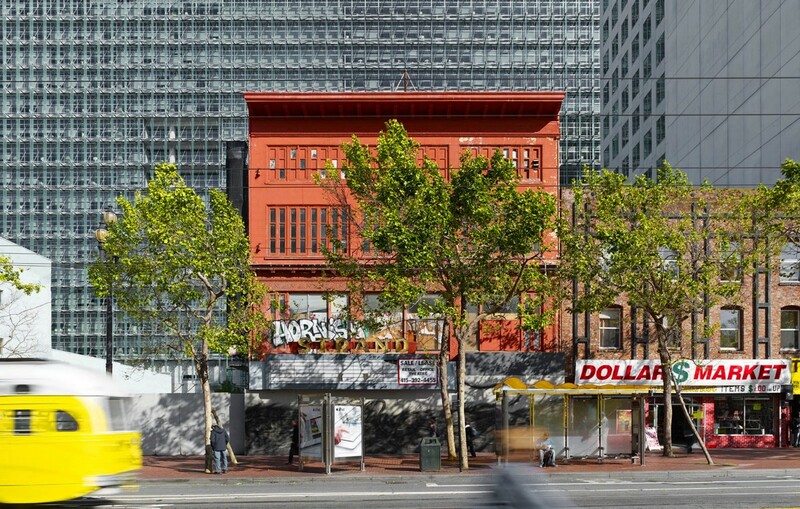 had purchased the 20,000-square-foot building in 2012, as the City of San Francisco began to promote economic development in the Central Market area. SOM’s design reuses and reinforces over eighty percent of the building’s existing superstructure, inserting a modern theater within the shell of the original cinema. The design reused and reinforced much of the original building’s steel frame, exterior walls, ceiling, and roof, while bringing natural light into the center of the building. 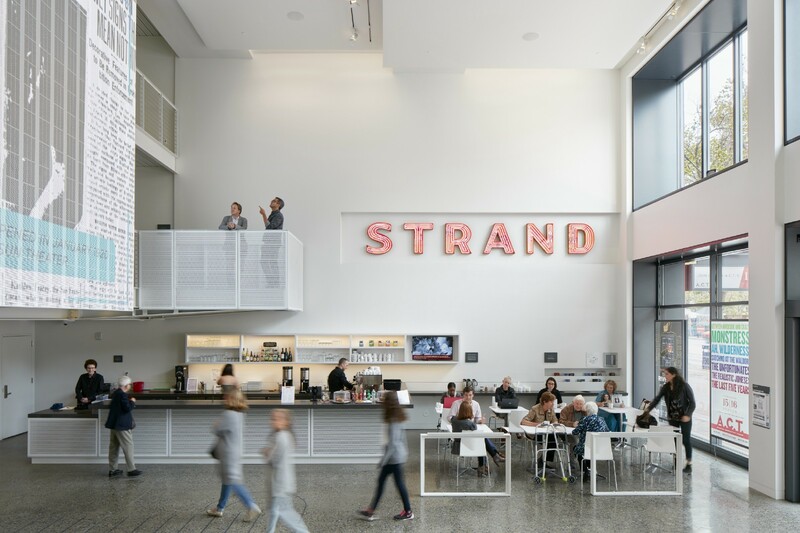 By reglazing the historic windows with insulated glass and installing new mechanical, plumbing, and electrical systems, the Strand was transformed into a model of sustainable adaptive reuse. 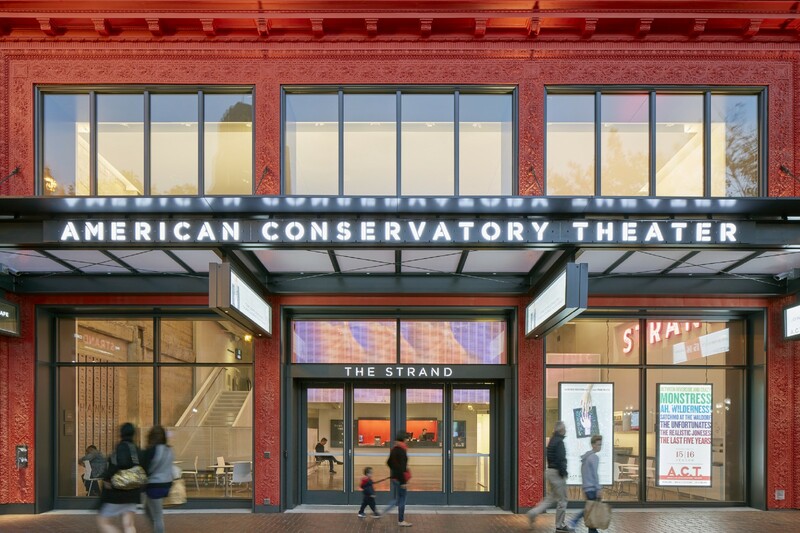 Since reopening in 2015, the theater has become a cultural destination in San Francisco — bringing new life to the street and contributing to the revitalization of its neighborhood. Since the demolition of New York City’s original Penn Station more than half a century ago, travelers using the Western Hemisphere’s busiest transit hub have suffered confusing passageways, dismal conditions, and overcrowding. The current facility, which was designed to handle 200,000 visitors per day, now approaches 700,000 daily trips. 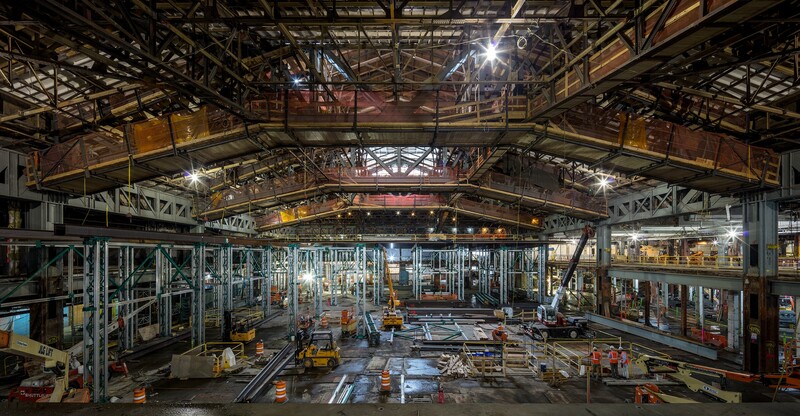 But across the street, a monumental adaptive reuse project is underway: the conversion of the James A. Farley Post Office building into a 21st century transportation hub. This Beaux-Arts building, completed in 1913 and designed by McKim, Mead & White as a complement to the original station, has sat mostly vacant for decades. 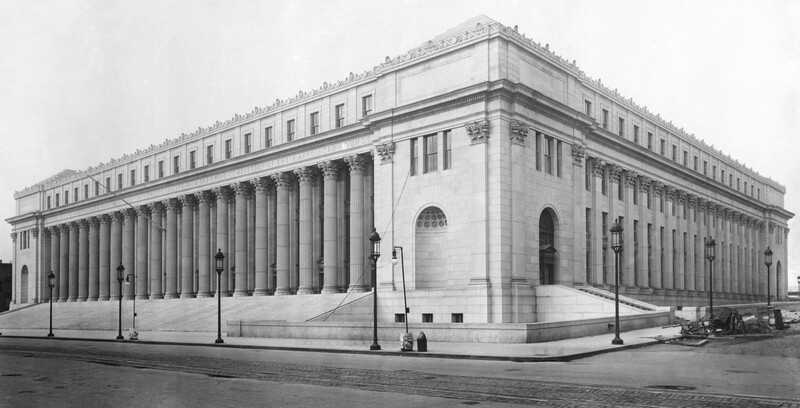 The Farley Post Office building, photographed shortly after its completion. Image courtesy Library of Congress. 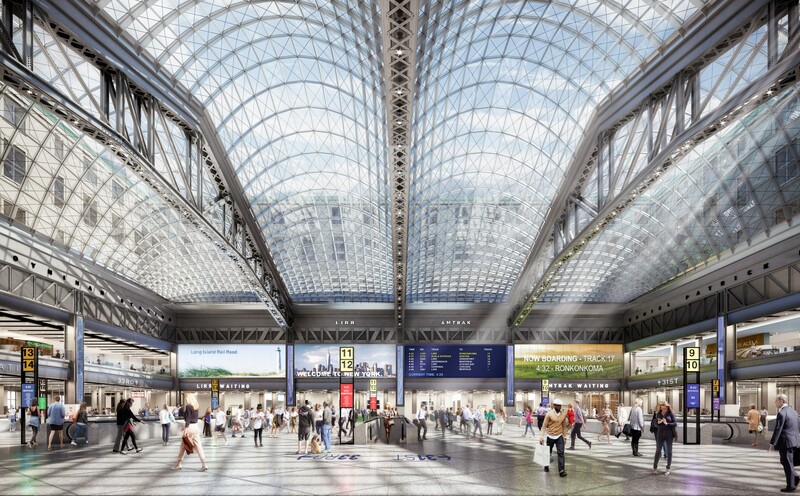 Today, the 1.4-million-square-foot building is being dramatically adapted to modernize and expand Penn Station and its transit infrastructure. 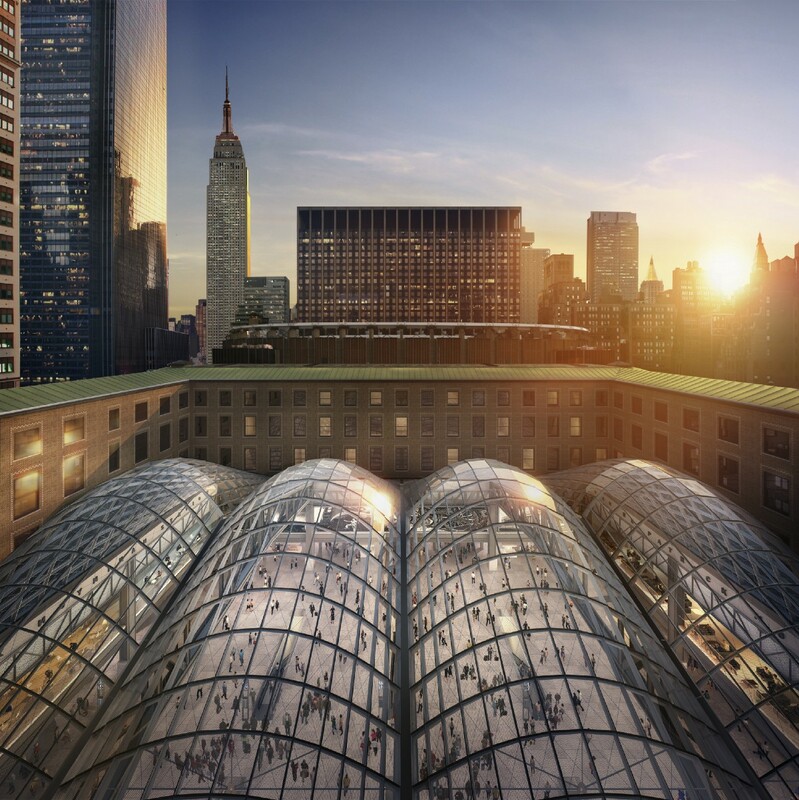 The new facility, named Moynihan Train Hall, will transform a massive and obsolete building into a model of sustainable, urban mixed-use development. 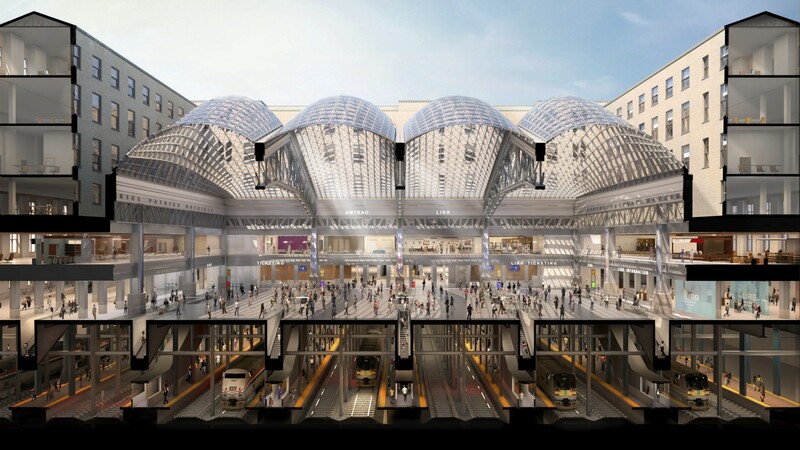 SOM’s design exposes and restores many of the building’s historic features and provides New Yorkers once again with a grand gateway to the city — even evoking the vaulted concourse of the original Penn Station. At the center of the building, a former mail sorting room and loading dock will be entirely transformed into over 700,000 square feet of new commercial, retail, dining, and office space. 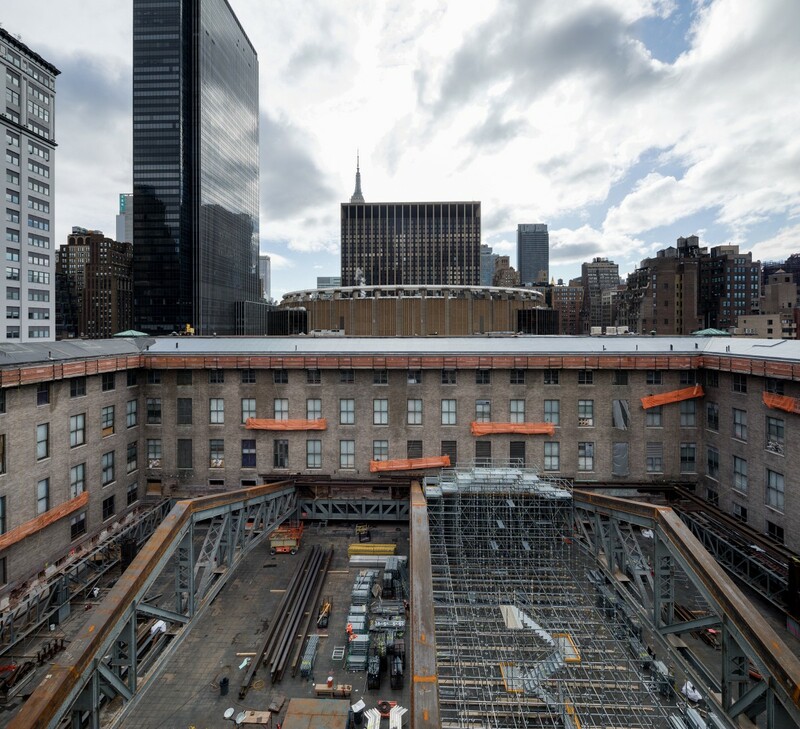 The original steel trusses above the internal courtyard will support a soaring, 92-foot-high skylight. These amenities will contribute to the economic growth and private investment in the ongoing renewal and development of Manhattan’s Far West Side. 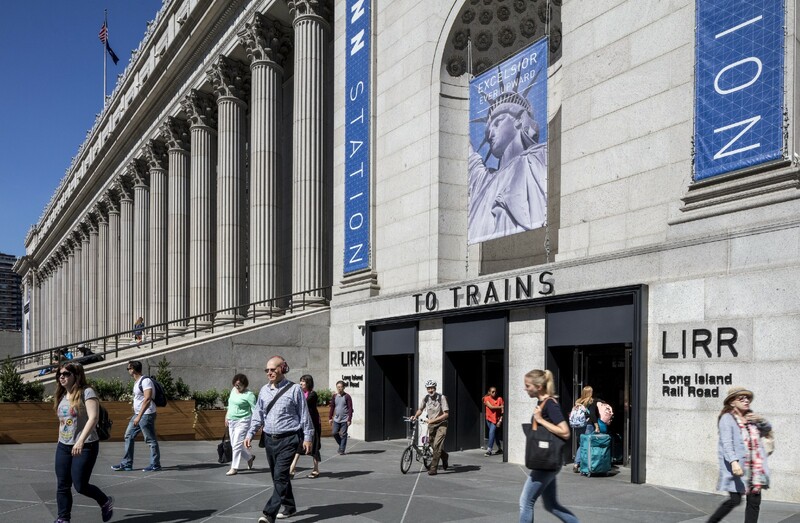 While the original Penn Station was demolished in the name of “progress,” today, the future of this transit hub — and of an entire Manhattan district — is being shaped through a bold, progressive act of adaptive reuse. Among the many strategies that cities must adopt for sustainable growth, adaptive reuse is a powerful solution that can resolve several key problems at once — increasing urban density, conserving culturally significant structures, and reducing carbon emissions. While reuse may not always be the right solution for every building site, it’s clear that any comprehensive and thoughtful approach to sustainable development must involve the creative reuse of what’s already been built. Frank Mahan is an Associate Director based in SOM’s New York office. As the leader of a studio within the firm devoted to adaptive reuse projects, he has played a major role in the renovation of New York City landmarks including One Chase Manhattan Plaza (28 Liberty), the Waldorf Astoria Hotel, and the Manufacturers Hanover Trust Company building (510 Fifth Avenue). Van Kluytenaar joined SOM’s New York office in 2018 as an architectural designer. He is a graduate of the master of architecture program at Princeton University.